Hurricanes are known as killer storms for a reason. 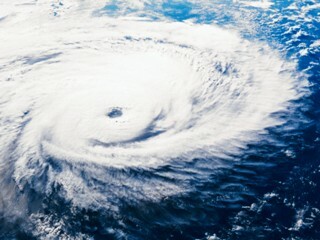 You must consider a hurricane a serious, life-threatening situation, and take necessary measures to ensure your family's safety, well in advance of hurricane season (June 1 - November 30). A "hurricane watch" indicates the possibility that you could experience hurricane conditions within 36 hours. This watch should trigger your family's disaster plan, and protective measures should be taken, especially those actions that require extra time such as securing a boat, leaving a barrier island, etc. A "hurricane warning" indicates that sustained winds of at least 74 mph are expected within 24 hours. Once this warning has been issued, your family should be in the process of completing protective actions and deciding the safest location to be during the storm. The National Hurricane Center is a great resource to stay up to date on current storm conditions or forecasts. In addition to the information below, you may view or download the Florida Department of Health's Family Preparedness Guide. The guide is available in English, Spanish, or Creole. Find the most convenient and safe evacuation route and the location of emergency shelters. Keep emergency numbers readily available to all family members. Designate two contact persons: one local and one out-of-town. Teach children how to dial long distance and help them memorize the names and numbers of your emergency contacts. Decide whether you should evacuate or stay at home during the storm. You must evacuate if you are ordered. If you must work during the storm, make arrangements for your family before you report to work. The Brevard County Special Needs Program is a voluntary program that should be considered by individuals who have NO alternative than a public shelter or need transportation to a shelter.